The Bonfire of the Vanities. New York: Farrar, Straus & Giroux, 1987. First edition of the author’s first novel. Octavo, original half cloth. Boldly signed by Tom Wolfe on the front free endpaper. Near fine in a near fine dust jacket. Jacket design by Fred Marcellino. 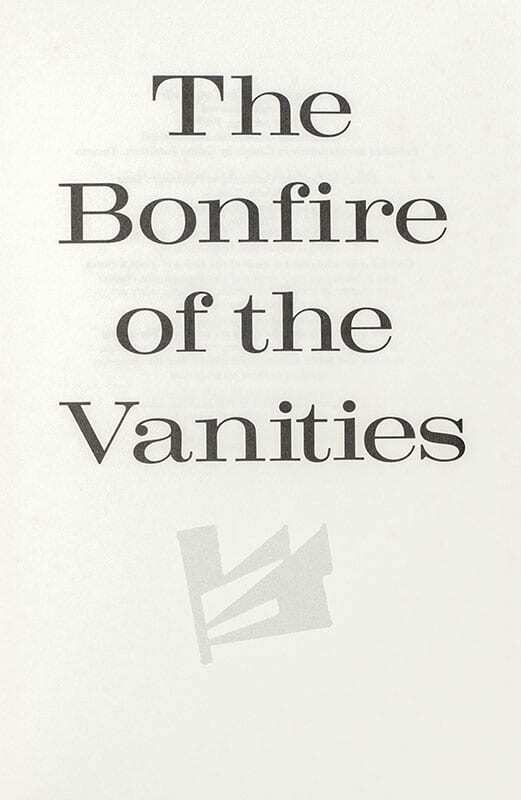 The Bonfire of the Vanities is a novel, but it is based on the same sort of detailed on-scene reporting as Wolfe's great nonfiction bestsellers, The Right Stuff, Radical Chic & Mau-Mauing the Flak Catchers, and The Electric Kool-Aid Acid Test. And it is every bit as eye-opening in its achievements. It is a big, panoramic story of the metropolis-the kind of fiction strangely absent from our literature in the second half of this century-that reinforces Tom Wolfe's reputation as the foremost chronicler of the way we live in America. "A big, bitter, funny, craftily plotted book that grabs you by the lapels and won't let go" (The New York Times Book Review). 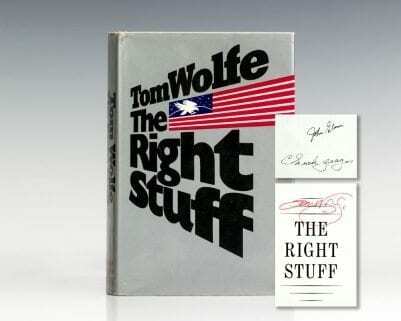 First edition of the re-issue of Tom Wolfe’s classic work. Octavo, original illustrated wrappers. Signed by Wolfe with his characteristic signature on the title page and additionally signed by John Glenn on the half-title page, who was a member of the Mercury Seven. In fine condition. New York: Farrar, Straus, Giroux, 1979. First edition of Wolfe’s classic work. Octavo, original cloth with titles to the spine in silver. Signed by Tom Wolfe on the title page and additionally signed on the half-title page by pilot Chuck Yeager and by John Glenn; one of the Mercury Seven. Fine in a near fine dust jacket. Jacket design by Kiyoshi Kanai. A very sharp example, rare signed by Wolfe, Yeager and Glenn. The Electric Kool-Aid Acid Test. New York: Farrar, Strauss and Giroux, 1968. First edition of the classic account of Ken Kesey and the Merry Pranksters during their bus trip across America in the late 1960’s. Octavo, original cloth. 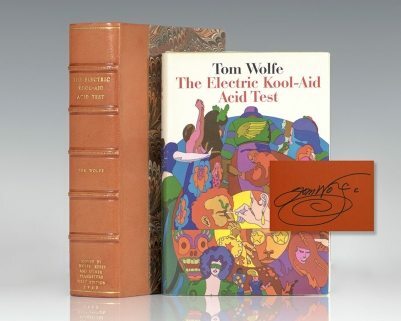 Boldly signed by Tom Wolfe on the front pastedown and signed by Ken Kesey in glittery pen on the front free endpaper. Fine in a near fine dust jacket. Jacket design by Milton Glaser. Radical Chic and Mau-Mauing the Flak Catchers. New York: Farrar, Straus and Giroux, 1970. First edition of the author’s fourth book, regarding the Black Panthers. Octavo, original cloth. Inscribed by Tom Wolfe and additionally signed by Angela Davis, both on the title page. Angela Davis is a political activist, academic scholar, and author. She emerged as a prominent counterculture activist and radical in the 1960s and had a close relationship with the Black Panther Party through her involvement in the Civil Rights movement. Fine in a fine dust jacket. Jacket design by Milton Glaser. Wolfe, Tom (Ken Kesey, Hunter S. Thompson). First edition of the classic account of Ken Kesey and the Merry Pranksters during their bus trip across America in the late 1960’s. Octavo, original cloth. 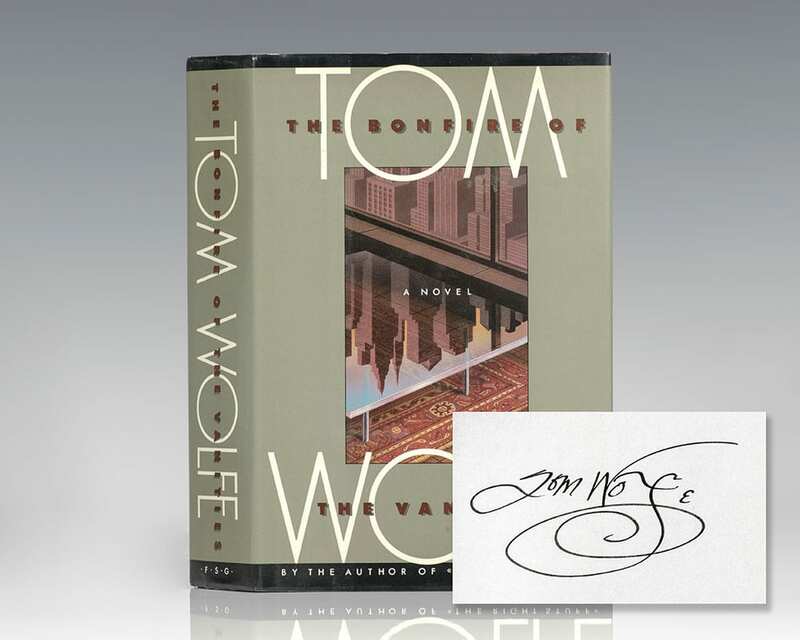 Signed by Tom Wolfe with his characteristic signature on the front free endpaper. Additionally signed on the title page by Ken Kesey, Hunter S. Thompson, Larry McMurtry, Ken Babbs, Ralph Metzner, Ed McClanahan and Paul Krassner. Dust jacket design by Milton Glaser. The rear jacket flap is signed by Milton Glaser. Fine in a near fine dust jacket with just a touch of shelfwear. Housed in a custom half morocco clamshell box. A unique example. The Kandy-Kolored Tangerine-Flake Streamline Baby. First edition of the author’s first book that launched New Journalism. Octavo, original white cloth. 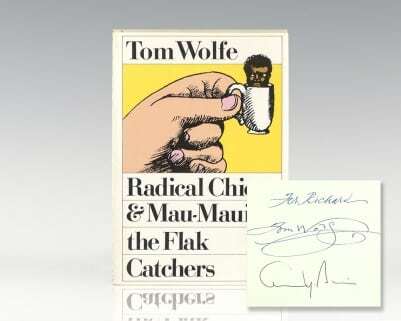 Signed by Tom Wolfe on the half title page. Additionally signed by Phil Spector and Junior Johnson on the front free endpaper. Both are subjects in the book, Phil Spector in “The First Tycoon of Teen” and Junior Johnson in “The Last American Hero.” Phil Spector is an American record producer, musician, and songwriter who developed the Wall of Sound, a music production formula he described as “a Wagnerian approach to rock and roll.” Considered the first auteur among musical artists, Spector acted not only as a producer, but also the creative director, writing or choosing the material and masterminding all phases of the recording process. He is acknowledged as one of the most influential figures in pop music history. The essay that many critics have considered the strongest is “The Last American Hero,” a profile of Junior Johnson, an early star of the stock car racing world and NASCAR. In looking at a single day at the races, Wolfe also examines the rise of the race day culture, how it is a stark contrast to the Grand Prix motor racing popular in Europe. The Last American Hero was made into a film in 1973, starring Jeff Bridges as Junior Johnson.Light rubbing, near fine in a near fine dust jacket. Rare signed by Wolfe, Spector and Johnson.